It's no much "why go" as "why would you not go?" Visible from outer space, with rock formations that pre-date dinosaurs for about a billion years, the mile-deep Grand Canyon National Park should be on every family's must-see list. With four-million-plus travelers coming each year, it's the country's most-visited national park. Most first timers with kids choose the South Rim, which is less remote than the North Rim and has more lodging options and services. Once inside the park, parents of young children may want to start with the Rim Trail, which is paved and passes many impressive lookout points. Note that there's no water on the trail, but you can fill up your bottles ahead of time in the Grand Canyon Village. The Rim Trail can also be traversed by bike and there are shuttle bus stops along the way to give hikers lots of flexibility — if kids are melting down, you can hop a bus back to the parking area. To give kids more of a taste of the wilderness, descend partway into the canyon on the beloved Bright Angel Trail, which begins with a fairly gentle grade, although it eventually reaches all the way to the bottom. There are water and rest stops along the way, and the park service suggests younger kiddos turn around after a half-mile walk, before the first switchback begins. As an alternative to driving, the Grand Canyon Railway train leaves from the wild-west–style town of Williams, Arizona, which historic Route 66 runs though, and takes passengers to the South Rim on a two-hour trip through changing landscapes like ponderosa groves and desert plains. For the best view, it's worth upgrading to a car with dome windows and a glass roof. There's entertainment on board, including music and even a light-hearted reenacted robbery with actors playing bandits on horseback. 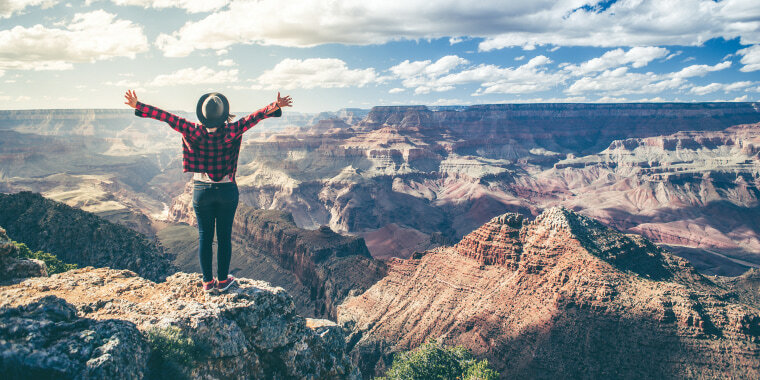 To maximize your time, consider staying inside the Grand Canyon National Park. These lodges are popular, though — spots open up 13 months in advance and go quickly. Persistent types may also be to book cancellations by calling the reservations office directly. Bright Angel Lodge has a primo rimside location but choose your digs carefully and be sure to confirm yours has multiple beds (not all do) or be prepared to reserve two rooms. Many families gravitate towards Yavapai Lodge, which is one mile from the rim (there's a shuttle available) but has modern, air-conditioned rooms in its East building, some with bunk beds. The El Tovar Dining Room is located in its namesake hotel, which opened in 1905 and is on the National Register for Historic Places. The menus include items that have been served for years, like prime rib hash, as well as ones with a Southwestern twist, such as beef tamales. Dinner is incredibly popular: Reservations open to hotel guests 90 days in advance and everyone else 30 days out, but breakfast and lunch are less crowded and more affordable. If your kids are lagging walking up the Bright Angel Trail, motivate them with the promise of ice cream from the Bright Angel Fountain, a scoop shop at the top near the trailhead that also serves up sweet canyon views.